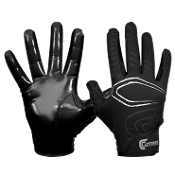 Take the field confident that you will make that game winning catch or hold on to the ball on 4th and goal when you are wearing a pair of top of the line youth football gloves. At Endzone Sports, we are your one stop shop for all your football gear including the best youth football gloves for all positions. Be confident that you will come down with the ball in the air with a pair of youth receivers gloves. If you need some added protection without sacrificing great grip then running back gloves are a great accessory to improve your game. If you're a lineman or need some added protection on your hands you need some of the top of the line Lineman football gloves. At Endzone Sports, we offer football gloves no matter what your playing situation is! The newest youth football gloves are better than ever and with the quality gloves that Endzone offers are proven to improve athletes performance when combined with their natural abilities. Youth receivers gloves from Cutters are built with C Tack technology that generates optimal performance in all weather and are machine washable.Lineman football gloves are built using frames and finger stays that keep your hands and fingers from hyper extending when you are battling in the trenches!